End of the day. The Tithonia on the right are about eight feet tall. What does that make the sunroot / Jerusalem artichoke on the left? These great rainy days who never wake; we sleep with them. And it is not hard at all to feel that we are still dreaming, as we move from mist to mist; that all the movements of our arms are like slow rivers who gather in the flowers, or the beans. I finished harvesting the raspberries just as it was too dark to see them anymore, and could not help but smile deeply at this certain kind of milestone: we have reached the point in the passage of the earth when both the sunrise and the sunset limit the hours that we can work. And how great to have this happen on a day who had neither, and so slept the whole way through — no sunrise, no sunset, just varying shades of fog. I will be moving the raspberries straight from the fridge to freezer Tuesday morning, so expect them that way, especially as the Wednesday harvest will probably also be wet. The sweet peppers are on their way out with the summer, the okra will slow as the temperatures cool, this week’s chard is a little light, and that lovely fourth generation of tomatoes is likely to burst with the rain to come. I harvested “breakers” this morning, trying to beat the pop. 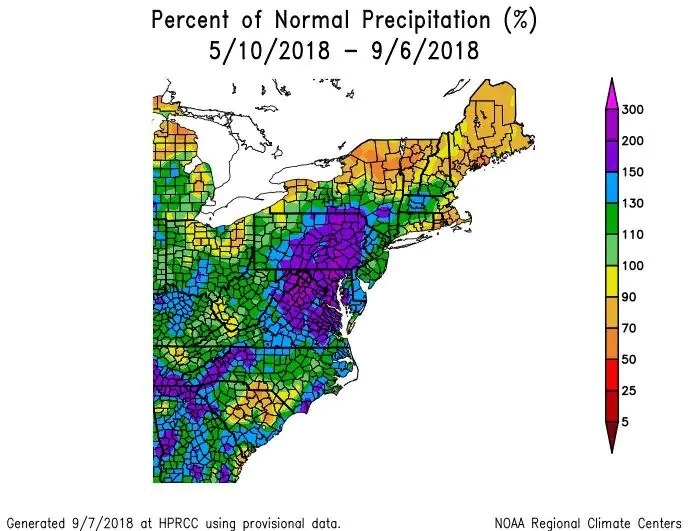 I saw a map this morning that generally listed our neck of the woods at greater than 300% of normal precipitation this summer. Too much rain + clay soil = a lack of oxygen -> the yields we saw this year. What might this coming hurricane do? There are five inches in the current forecast, on top of the 1.3 that just fell … but other models show 1 to 2 feet! I direct seeded the spinach and transplanted the fall lettuce, and put down cover crops last week. If we don’t wash away, all of the essential field work for the fall is done. Now we just tell the fields, “Hang in their Tiger,” and let what happens happen.